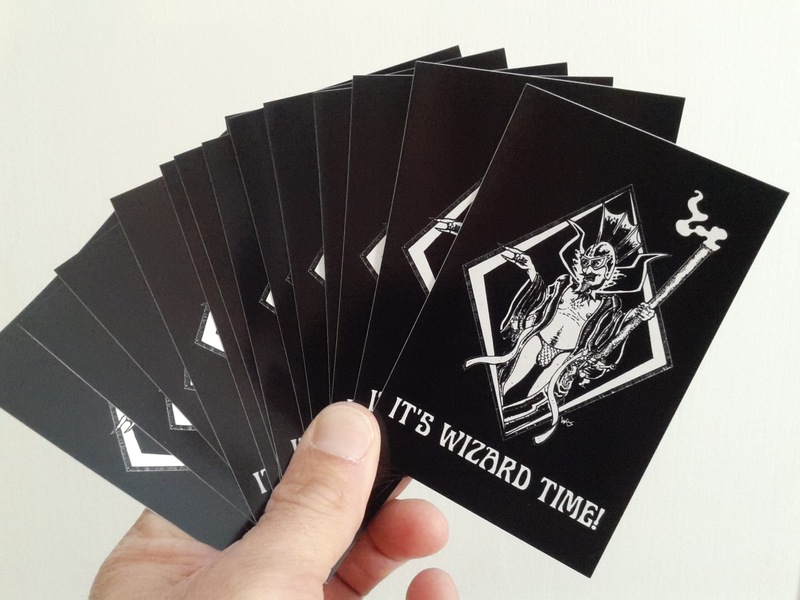 The people asked for more “It’s Wizard Time!” Stickers and I obliged. That’s right, fancy vinyl stickers. Black and White, 4.25 x 2.75 inches. Supposedly able to withstand several years of exterior application. I’ve had one on my van for two years and it’s just fine. USA only. If you are in another country, send me a message and we’ll work something out. Don’t forget to add your mailing address! Posted in Art work, Metal Gods of Ur-Hadad, News! 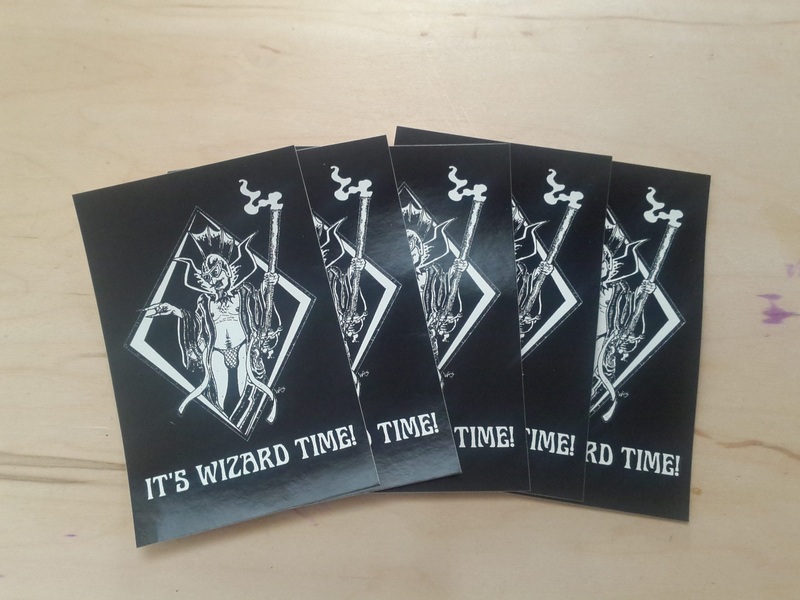 I have just received a new shipment of quality It’s Wizard Time stickers! I am sold out of stickers. Thanks everyone. That’s right, fancy vinyl stickers. Black and White, 4.25 x 2.75 inches. Supposedly able to withstand several years of exterior application. Posted in Art work, Dungeon Crawl Classics, Metal Gods Zine, News! Posted in Art work, Dungeon Crawl Classics, Metal Gods of Ur-Hadad, News! New Metal Gods of Ur-Hadad Wizard T-shirt on sale now! The band of Chaos Wizards who bring you the Metal Gods of Ur-Hadad Zine are at it again with a new t-shirt design to enhance your wardrobe. To order yours, you must send me the money for the size you want and the shipping amount to this Paypal account. You must include the size(s) you want and your mailing address with your order payment. LADIES add $1.50 per shirt to order fitted woman’s tees. Shipping is 5$ to Continental US. 10$ Everywhere else. If you are ordering multiple shirts, I can fit 2 shirts into an envelope and mail them at 7$ Continental US and 13$ Everywhere else. This sale will run until 3/31/15. Then I will send the order to the printer. They will print the shirts with a turn around of about 2 weeks. I will then pick up the shirts and ship them out in the next few days. Maximum turn around from beginning of the sale to the ship date should be 24 days. I know this isn’t lightning fast like most internet shops, but this is a DIY operation, I like working with local people and being able to see what my product looks like before it goes out. So this is how I do it. I did it this way with the second run Catastrophe Island shirts and it worked out just fine. The image is silk screened on good quality black tees using a single pass of white ink. This gives the image a cool vintage look and preserves the tiny details of the original drawing which a second pass of ink has a tendency to bleed out. Any questions can be directed to the email address above or mrwaynesnyder (at) gmail (dot) com. All proceeds from this sale go towards our Wizard Van Project! 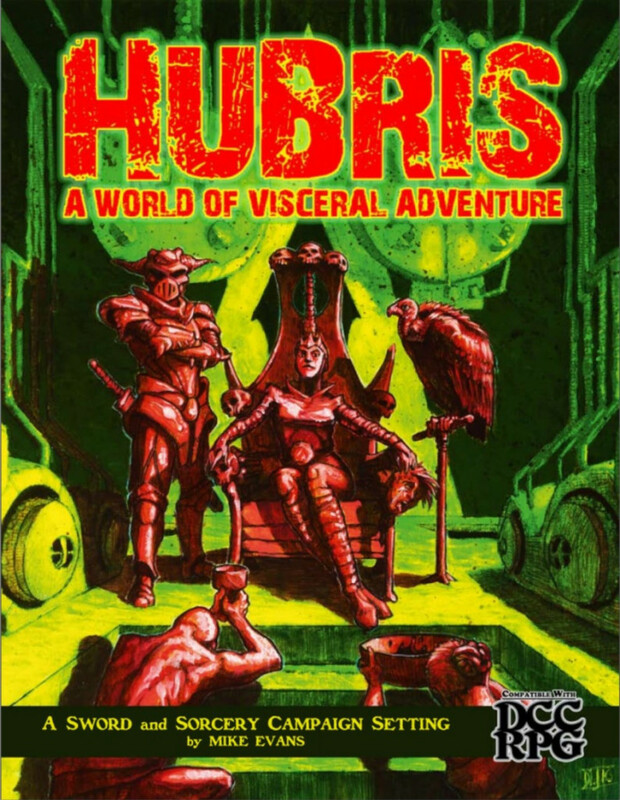 Posted in Art work, Dungeon Crawl Classics, Metal Gods of Ur-Hadad, Metal Gods Zine, News!